This post is part 3 of 4 of a suggested itinerary through Northern Yucatan, Mexico. If you missed it, be sure to read the Overview (part 1) and Days 1-2 (part 2) first. 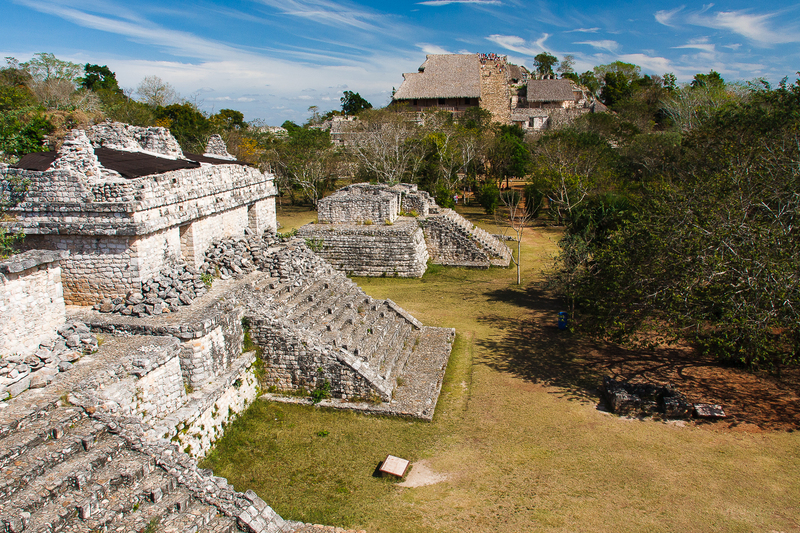 The ruins at Ek’ Balam are smaller than those of Chichen Itza, but more architecturally unique. 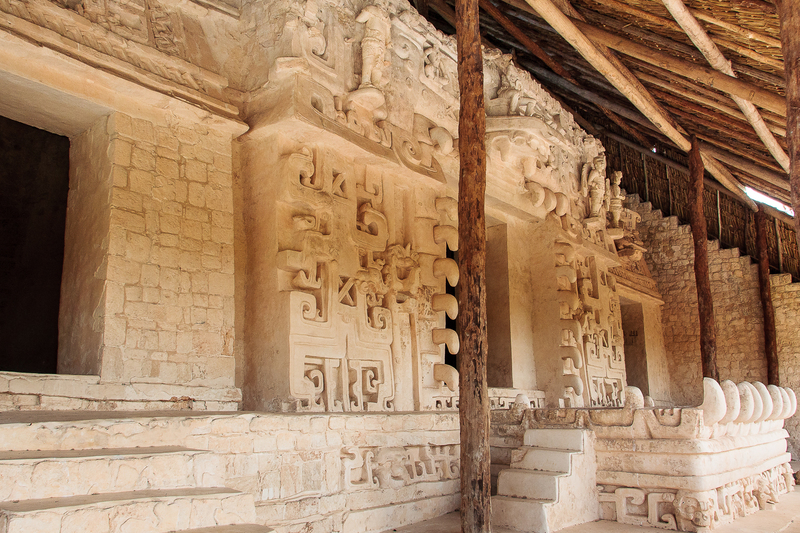 Before leaving for Merida, we recommend taking a taxi to see the ruins of Ek’ Balam – a secluded but charming set of ruins about 20 minutes north of Valladolid. Taxis can be found near the bus station. Collectivo taxis run between Valladolid and Ek’ Balam for around $12 each way, and the cost can be split amongst 4-6 people (depending on the size of the car). If you are traveling alone or with someone else, you may have to wait for the driver to collect additional passengers in order to share the cost. If you are in a hurry, you can pay the entire fare outright. The structure known as The Twins, atop of which there are two mirroring temples on either side. Ek’ Balam (which in Mayan means “dark jaguar”) is smaller and quieter than Chichen Itza, but still very impressive. 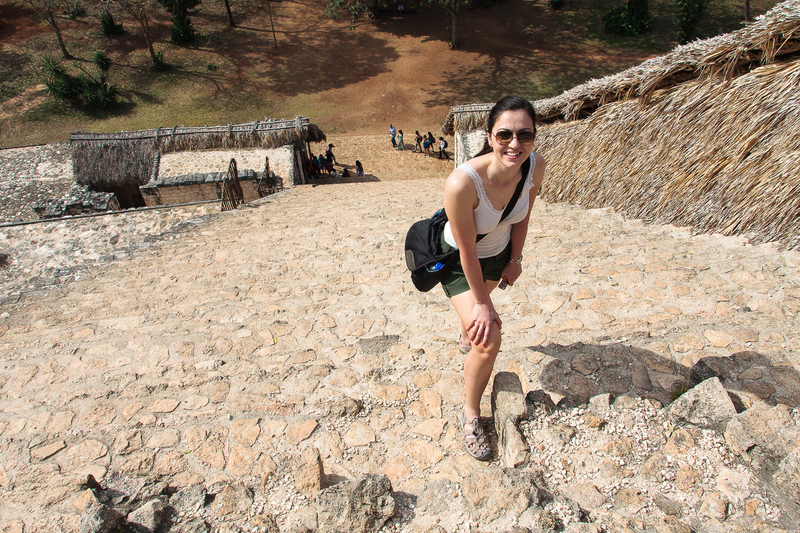 One of the benefits of visiting smaller ruins is that you are allowed to climb all over everything. The site contains 15 or so well-excavated structures. Of note is the massive El Torre (or Acropolis) which rises 98 ft (30m) above the tree line, providing scenic views in every direction. The imposing central pyramid known as El Torre (or Acropolis) easily surpasses Chichen Itza’s El Castillo in size. 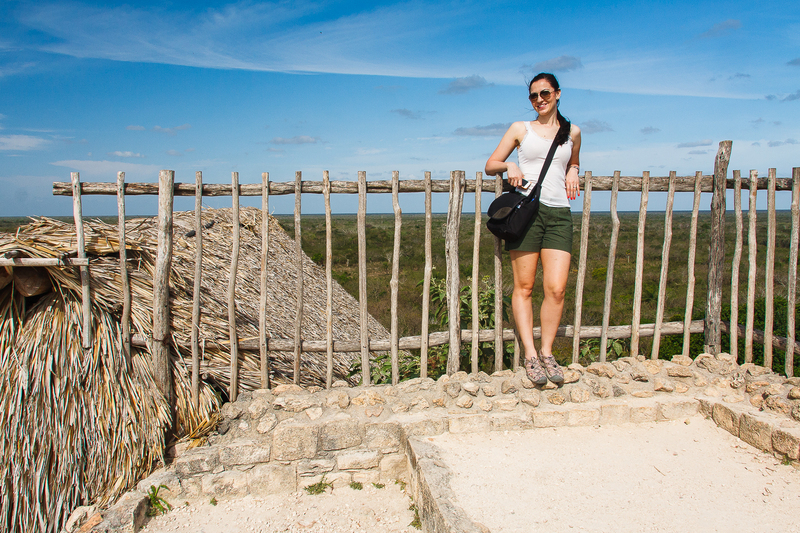 Admission cost for Ek’ Balam is around $2.80 with an additional $5 for the tourism tax (which is included in all attractions within the state of Quintana Roo). Each of these fees must be paid at a separate window in the visitor center. The site is open from 8am to 5pm. 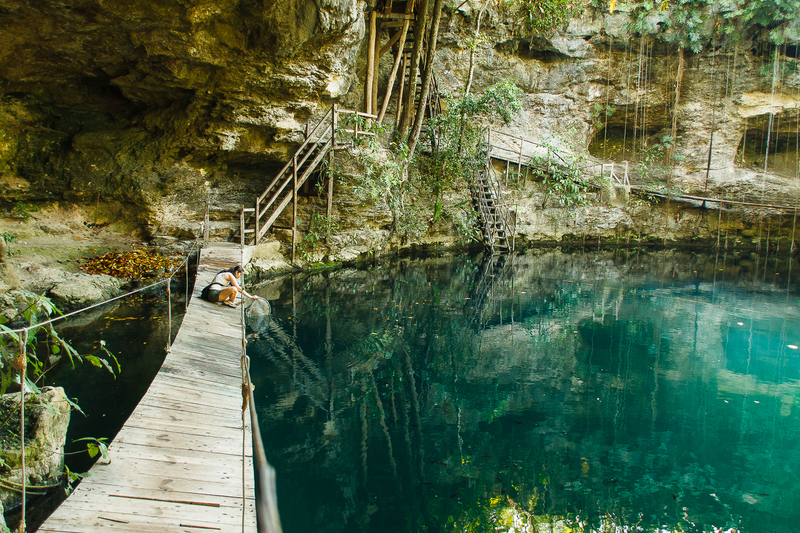 There is a picturesque Cenote Xcanhé about 1 mi (1.5k) east of the Ek’ Balam ruins. A dirt road runs from the entrance to the archeological park to the cenote. There are two ways to get to the cenote: by foot (for free), or by renting a bike at the visitor center (much faster and more fun; $5.60). Admission to the cenote is around $2.40, but the fee can often be waved through negotiation when you opt to rent bicycles. 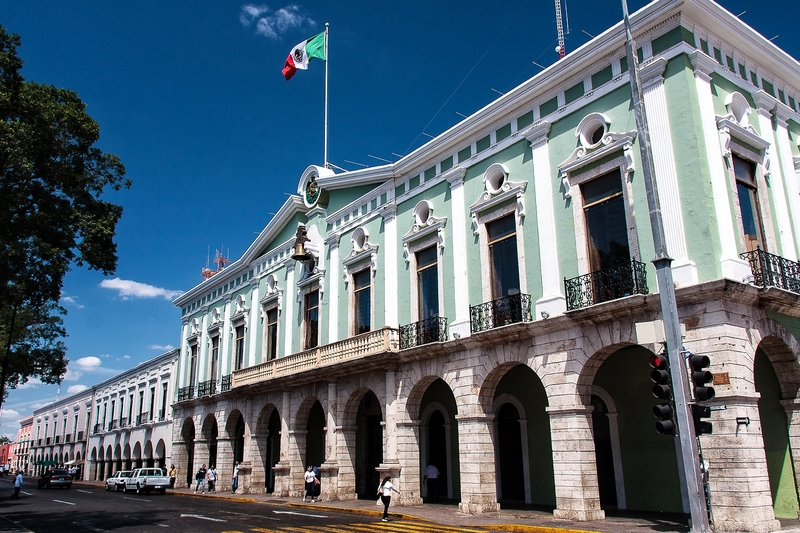 The city of Merida is the capital, and cultural heart and soul of the Yucatan. Bus fare from Valladolid to Merida costs around $12 one way and the trip takes 3 hours. You’ll arrive in the “White City” at the first class bus station, CAME, from which you can easily take a taxi to any location in the city. 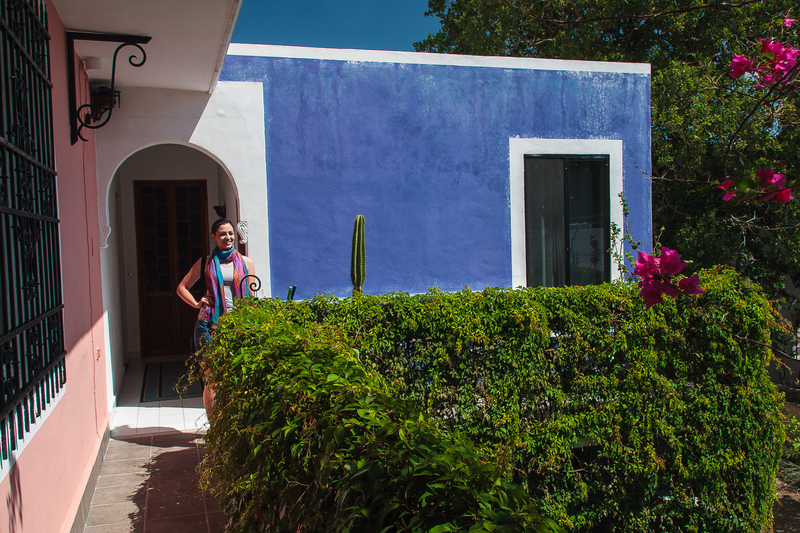 Merida has plenty of accommodation options, but we found the Hotel Julamis to be delightful. Rated on Trip Advisor as the #2 hotel in Merida, you’ll want to book early if you plan to stay in one of its seven artfully decorated rooms. The hotel is conveniently located with walking distance of Merida’s bustling Plaza Grande, fashionable Paseo de Montejo, and many other sites. Complementary breakfast is served each morning in a central garden courtyard. Drinks are served in the evenings on the roof top terrace. But what makes this hotel rise above the rest is its very generous host, Alex. No matter what you need, simply ask and he is happy to accommodate. Outside El Ramón, our room at Hotel Julamis. If you’re interested in tasting all the delicious fare that Merida has to offer, just ask Alex for meal recommendations. We ate at a nearby restaurant called La Chaya Maya. 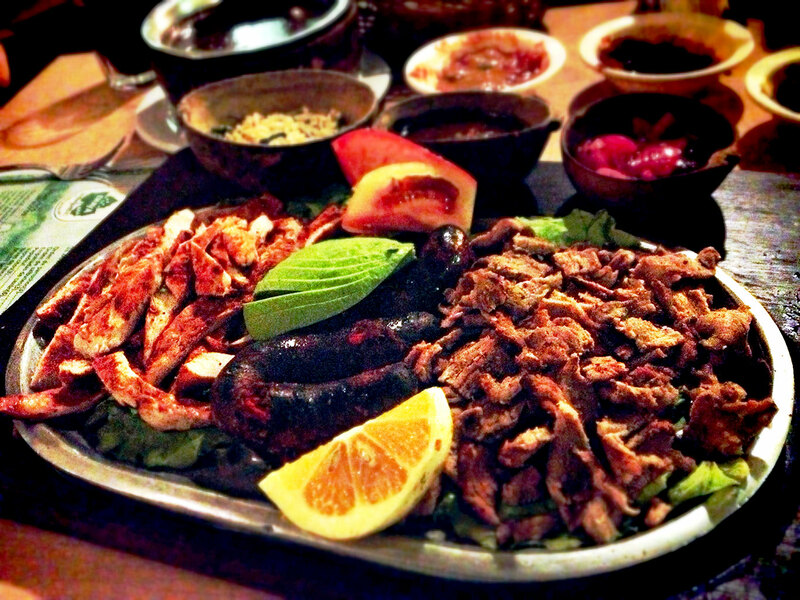 We shared a dish called Parrillada Yucateca, which also included a delicious black bean soup. At around $24 for two, it falls squarely in the “moderate” category; but the food is delicious, the ambiance is amazing, and for us it was a worthwhile splurge. 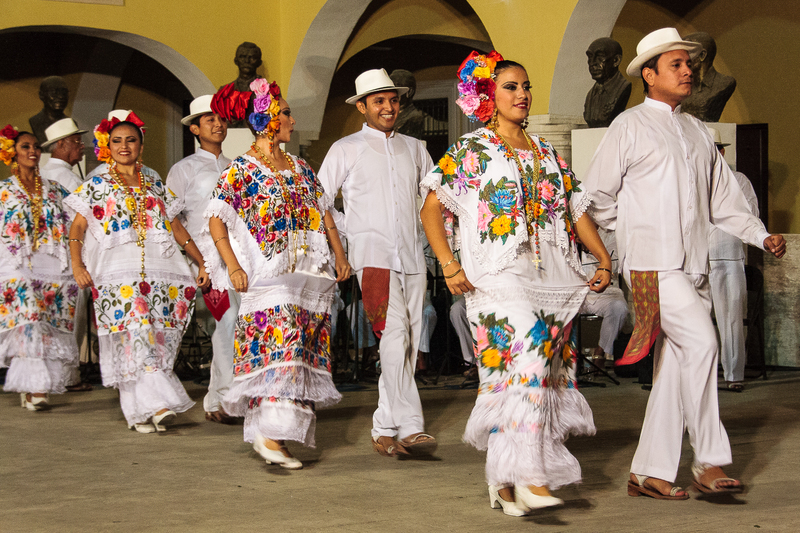 Merida offers cultural performances nearly every night of the week in various locations throughout the city. We stumbled upon a music and dance performance in Parque Santa Lucía, just around the corner from La Chaya Maya. We finished off the evening under a large tree, serenaded to the sounds of Spanish music and treated to the vision of traditional Mayan dances. 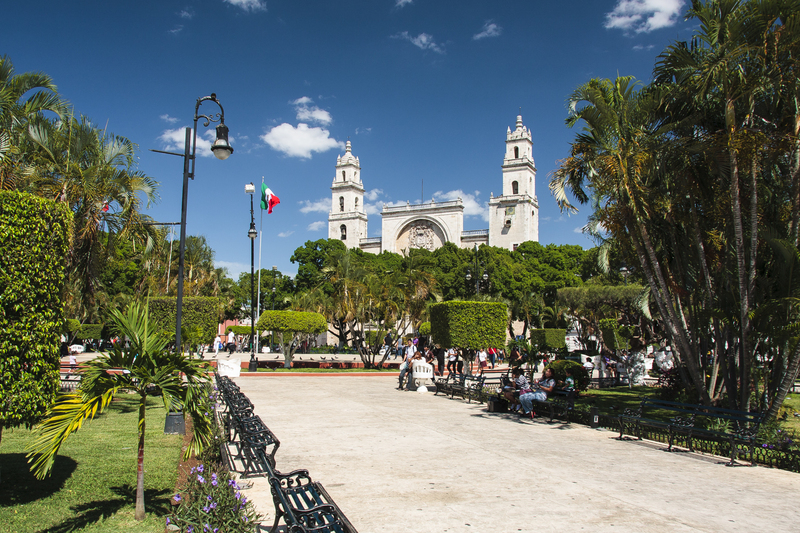 Visit the Plaza Grande – the bustling central square of the city. The tree-filled plaza is lined with benches, making it a great place to meet people. The square is bordered by colorful, colonial-style buildings, with the prominent, fortress-like Catedral de San Ildefonso on the northeast corner. Tour the Museo de Arte Contemporáneo Arteneo de Yucatán. This free contemporary art museum showcases works by contemporary Yucatan artists. Located in the old bishop’s palace on the northeast side of the Plaza Grande, opposite the cathedral. Take in the view from the balcony of the Palacio Municipal (city hall). 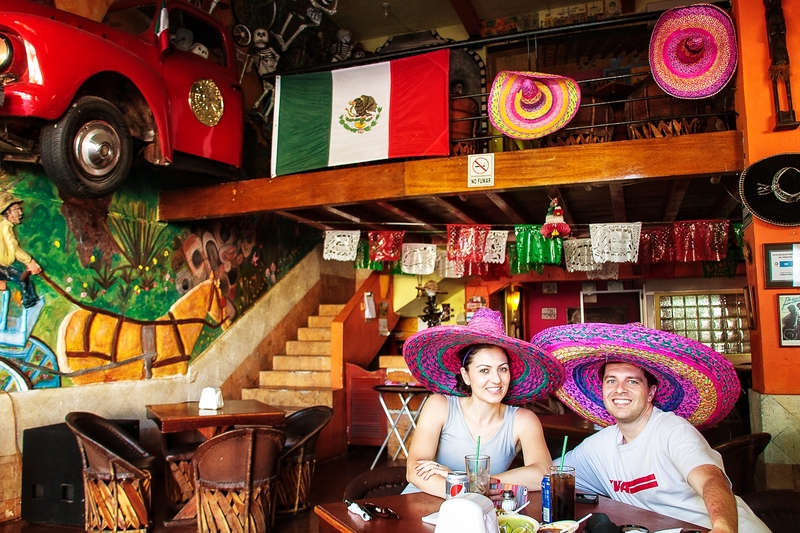 Just walk in and climb the stairs for great views of the Plaza Grande. 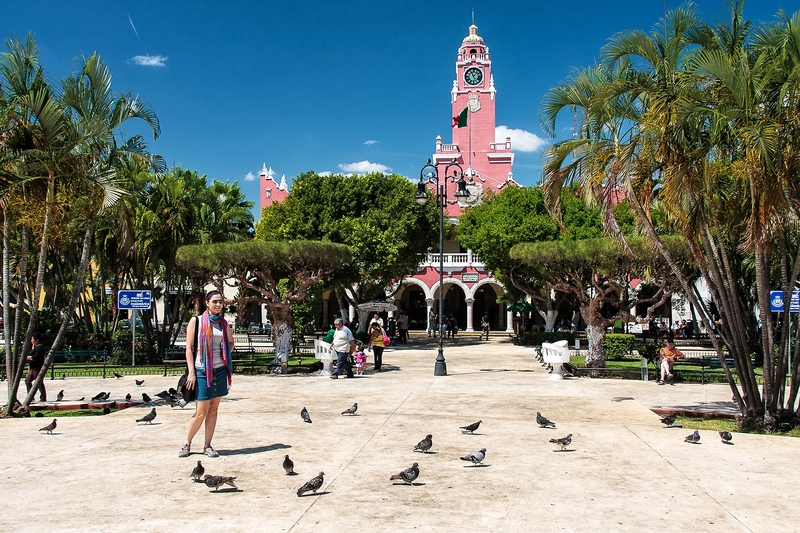 The city hall is the large, pink building on the west side of Plaza Grande, and is recognizable by its clock tower. 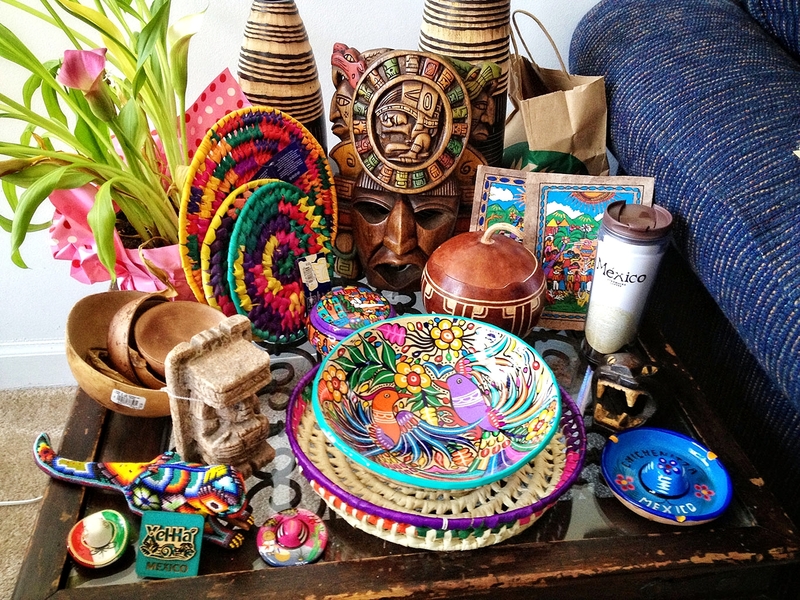 Shop at the Casa de las Artisanías. The streets surrounding the Plaza Grande are rife with shops selling hammocks, guayaberas (the loose-fitting white shirt worn by many Mayan men), Panama hats, and countless other souvenirs. We were warned by our hotel proprietor that many of these shops produce their wares using sweatshop laborers. We were encouraged to shop at the state-run Casa de las Artisanías, which sells a wide variety of high quality crafts from the Yucatan. The prices are a little higher than some of the surrounding shops, but the money goes directly back into the pockets of the artists. We purchased 10 items as gifts and spent around $43. The Casa de las Artisanías is located in an old monastery on Calle 63, two blocks west of Plaza Grande. Stop by the Museo de la Ciudad (City Museum). The museum is located a few blocks southeast of Plaza Grande on Calle 56 in the old post office building. It contains exhibits relating to Merida’s history. It’s free to visit and can be a nice break from the afternoon heat. Explore the Mercado Lucas de Gálvez. 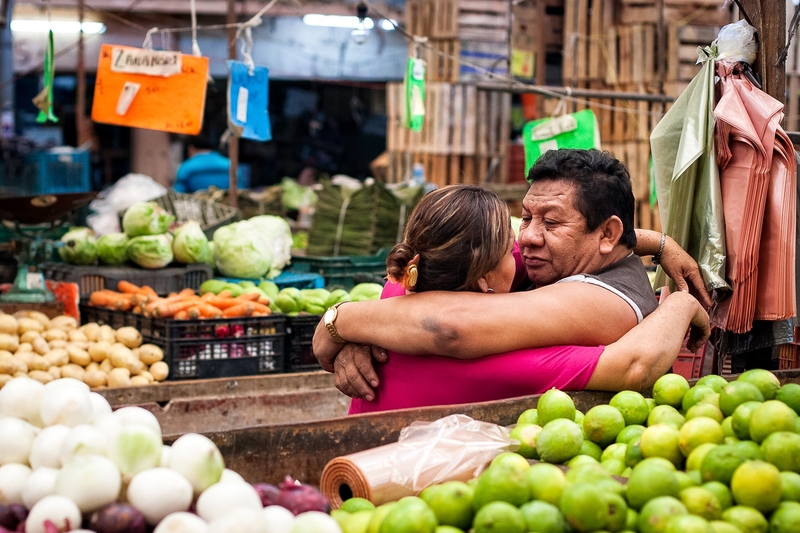 This bustling market has everything from fish to flowers, fresh tortillas to fruit, religious paraphernalia to auto parts. It is by far the most crowded (and authentic) part of town. The covered market is accessible via the street across from the old post office building between calles 58 and 60. Stroll down the Paseo de Montejo. This fashionable, tree-lined boulevard features the mansions of Merida’s wealthy 19th century plantation owners. The boulevard was modeled after Paris’ Champs Elyesées, and starts at Calle 47, seven blocks north of Plaza Grande. The far end of the boulevard features the Monumento à la Patria, a large monument carved in an elaborate Mayan style. Take a calesa (horse-drawn carriage) on a tour around Merida. Carriages are available next to the Catedral de San Ildefonso across from the Plaza Grande. A 45-minute ride costs around $20. We at lunch at a colorful restaurant called La Parranda Centro on Calle 60 (between calles 57-a and 59, across from Parque de La Madre). The decor was festive, the food was good, and the staff were fun. At one point, they handed Zena a gun and offered to take her picture. A few seconds later, one of the practical joking staff created a loud bang using an inflated bag, startling Zena when she thought she had accidentally discharged the gun. Lots of laughs once she realized what had happened. If you plan to stay around Merida for a couple of days, there are a couple side trips outside the city worth mentioning. Izamal is a charming town about 50 miles (80km) east of Merida. It’s known as the “Yellow City”, since the entire city center is painted with an ochre-yellow paint. Just overlooking the Izamal’s town center is the impressively large Kinich Kakmó pyramid, offering grand views free of charge. Wandering Earl thinks so highly of Izamal that he schedules a night there on his Wander Across Mexico Tour. Celestun National Wildlife Refuge, on the Gulf Coast west of Merida, contains one of North America’s only two flamingo breeding colonies. A 75-minute boat tour of the flamingo refuge costs just under $60 (the cost can be shared amongst six passengers). 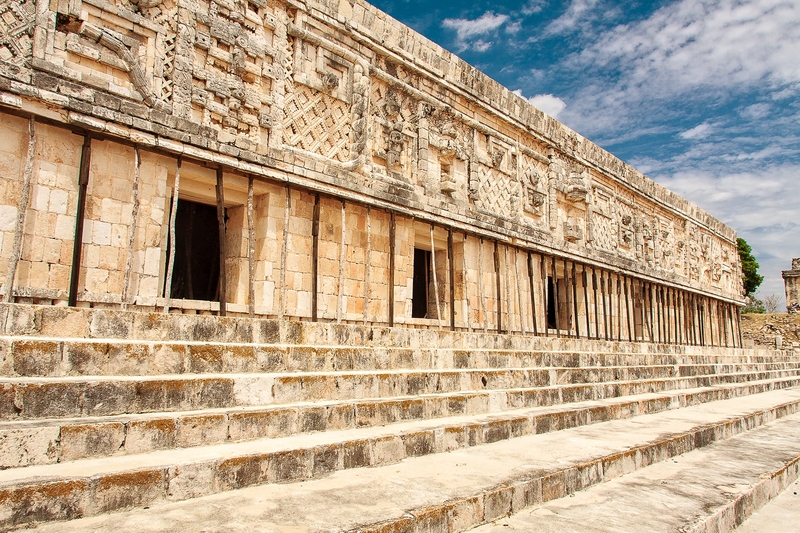 Uxmal (pronounced “oosh-mahl”) is a Mayan city that is different from the others in that it contains expansive structures with intricate stone facades. 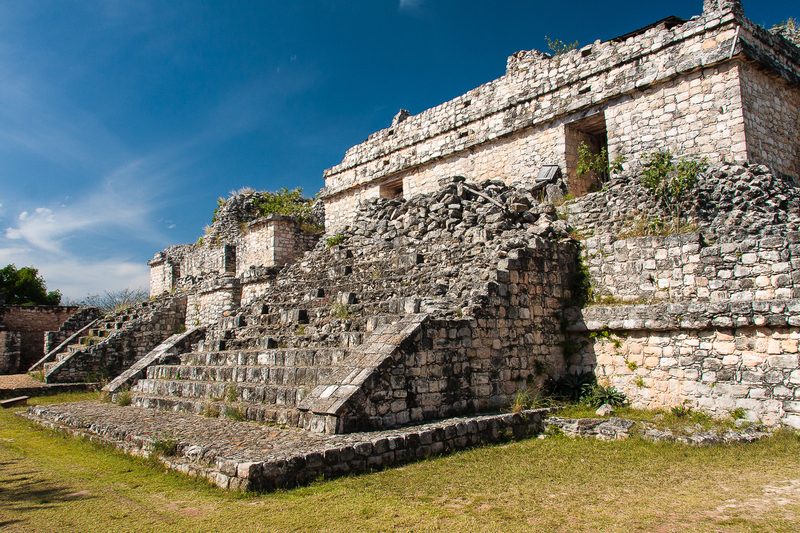 Additionally, some of the structures of Uxmal are built into the varied elevation of the hilly landscape. Due to it being a significant example of the local Puuc architectural style, Uxmal has been designated as a UNESCO World Heritage Site. Uxmal lies 50 miles (80km) southwest of Merida. 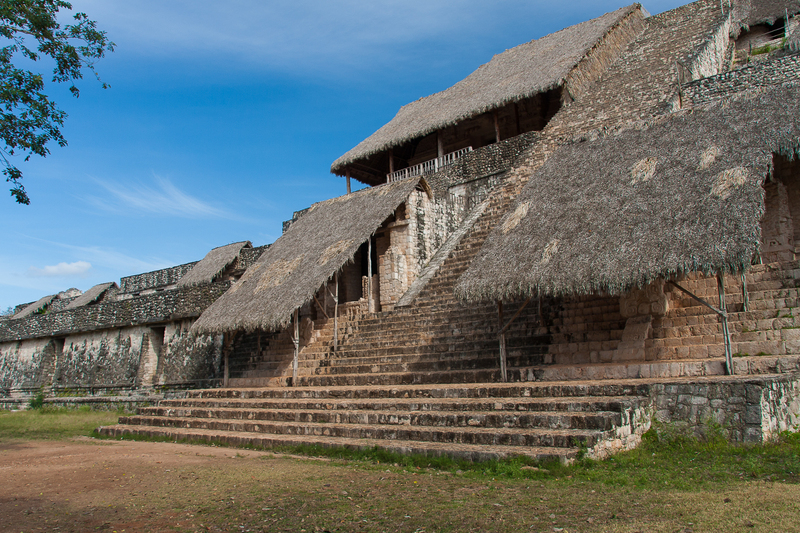 To get there, purchase a one-way bus ticket ($3.80) to Uxmal from the 2nd-class bus station in Merida. The bus ride takes about 1.5 hours and will drop you off at the road that leads to the site. Before you exit the bus, be sure to note the return schedule so that you’re not waiting for hours at the bus stop later. You’ll need to purchase two tickets to enter: $10 for entry and $4.60 tourism tax. Be prepared to spend several hours exploring the ruins. 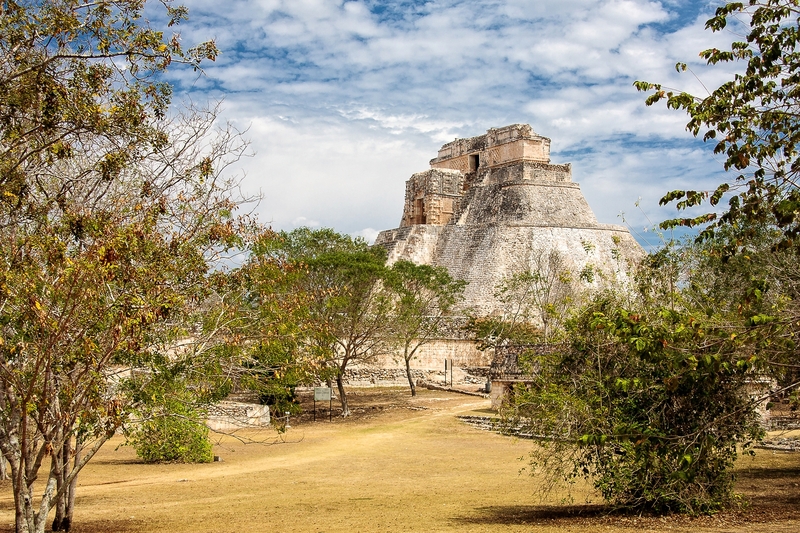 When you finish at Uxmal, head back to the main road and catch a return bus back to Merida. You can purchase your ticket on the bus once it arrives. Take a taxi back to the hotel, check out, and then make your way to the first-class bus station (CAME). Purchase a ticket to Playa del Carmen ($30) and load up on snacks, because you’re in for a 4.5 hour ride.